Learn how to make a nice variation of the traditional origami Tato envelope! Traditionally used to give money, you get a larger envelope with this one. There is something really satisfying about origami 'Tato' - a "tato" is a small kind of folded purse or envelope, which is used to store small items, such as thread, stamps, coins etc. This is a very nice way to give someone a money gift, or even wrap jewellery. A small note card can be included inside, or written on the inside or back. You could also hang these as a decoration! 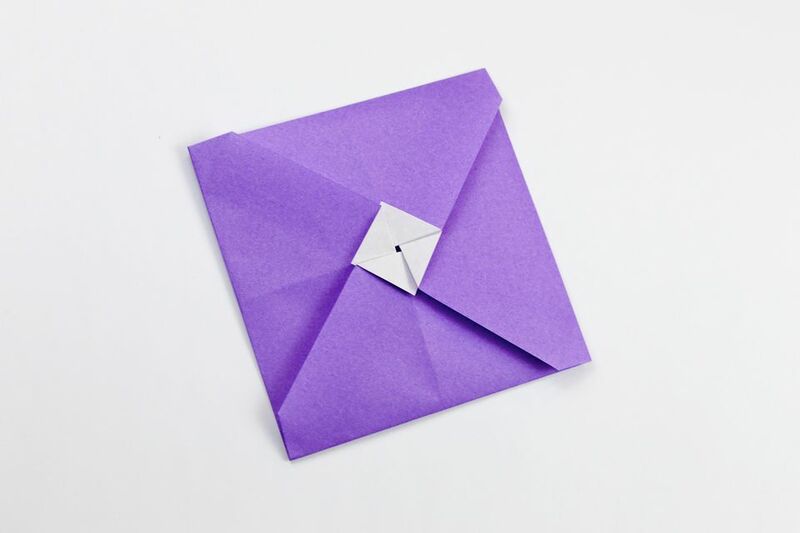 You'll need one sheet of square paper for this origami envelope. Using paper with a different colour or pattern on each side would work the best. You can find the original origami tato envelope, here - on the front is a pinwheel design. Because this one folds less at the start, you get a larger envelope than the original. For more origami envelopes, check out the Envelopes section, or the Origami Envelope Box Tutorial and these super easy envelopes. 1. Start with your paper white side up and diagonally, like a diamond. 2. Fold the paper in half, top to bottom, unfold. Then fold the paper in half, left to right and then unfold. * Why not experiment with this fold, make it higher for a different result. 4. Now fold the flap down, along the horizontal crease underneath it. 5. Fold the right corner over to the left, it should meet the left-most edge of the bottom flap, along the horizontal crease. 6. Fold the flap back to the right, again using the central vertical crease as a guide. 7. Repeat the last step on the top corner. 8. And again repeat the last step on the left corner! 9. Open the left side out again. 10. Whilst you are holding the bottom section open a little, refold the left flap back to the right and underneath the lower section. 11. The lower left crease is reversed here. 12. Flatten it all out and it's complete! Now that you have made this one, why not try the original version of this origami Tato, which can be found, here.